Poland and South Africa express a collaboration intent on maritime economy development. The signing of a Memorandum of Understanding between South Africa and Poland in Cape Town on Wednesday marked a turning point in the development and enhancement of relations between the two countries and which will benefit both in the long term particularly with regards maritime sector issues. This is according to South Africa’s Transport Department deputy Minister, Ms Sindisiwe Chikunga and Poland’s Minister of Maritime Economy and Inland Navigation, Mr Marek Gróbarczyk during the ceremony of the welcoming to South Africa of Poland’s centennial independence celebration’s vessel, Dar Młodzieży at the port of Cape Town. Polland’s centennial independence celebration vessel, Dar Mlodziezy arriving in Cape Town harbour on Wednesday. where it will remain until Friday. The vessel with a crew of some 250 members on aboard including about 60 cadets, is on a round-the-world trip that began recently in Poland and shall continue until the end of March 2019, with stop-overs in as many as 22 ports around the world. South Africa was the second stop over on Wednesday, where the vessel will remain at the port of Cape Town in a jetty adjacent the Victoria & Alfred Waterfront at the foot of Table Mountain until Friday. On arrival in Cape Town late morning on Wednesday to sounds of the South African Navy’s brass band at Cape Town harbour’s cruise terminal, crew and passengers of Dar Młodzieży were formally welcomed on South African soil by Ms Chikunga on behalf of the South African government, along with Mr Gróbarczyk, Poland’s Ambassador to South Africa, Mr Andrzej Kanthak and other senior government officials including South African Maritime Safety Authority (SAMSA) Chief Operations Officer, Mr Sobantu Tilayi. Thereafter, the Polish maritime students and cadets who were joined by their South African counterparts from the Cape Peninsula University of Technology (CPUT) for a combined group of about 200, were later treated to a braai on board South Africa’s only dedicated cadet training vessel, the SA Agulhas. In-between the events, Ms Chikunga and Mr Gróbarczyk signed a Memorandum of Understanding on the basis of which, they said, the two countries would endeavor to enhance co-operation and joint pursuit of socio economic development initiatives but especially in relation to the maritime economic sector. Areas of likely immediate focus would include ship repairs and maritime education and training, said Ms Chikunga, while Mr Gróbarczyk felt it also an opportune time for the two countries to enhance relations ahead of South Africa’s hosting of an International Maritime Organization (IMO) conference in the country in 2020. In the video clips below, Ms Chikunga (clip 1 lasting 3 minutes) and Mr Gróbarczyk each explains the genesis of the development and the respective country’s hopes to strengthen relations. Meanwhile, also in remarks welcoming the group of Polish and South African maritime students and cadets on board the SA Agulhas late Wednesday afternoon, Mr Tilayi described it as important the establishment of sound relations with countries such as Poland which would benefit South Africa’s emergent pursuit of redevelopment of its own maritime economic sector. For his full remarks, click on the video below. On Friday, the group will be taken on a tour of Robben Island before the centennial independence celebration vessel set sail yet again, this time for Madagascar. South Africa’s expansion of the reach of maritime education and training through extension also to the country’s Technical and Vocational Education and Training (TVET) institutions beginning 2017, is facing huge challenges, among which is the lack of suitably qualified tutors. But the challenges may thankfully lead to high creativity and innovation. Mr Edward Pines, Senior Manager, Curriculum Development: South Africa Maritime Safety Authority (SAMSA) . One such innovative solution, according to Mr Edward Pines, a senior manager for curriculum development at the South African Maritime Safety Authority (SAMSA); is the likely introduction of online tutoring – or e-learning – for certain maritime education modules, beginning with at least three STCW Modules for marine engineering students. A week ago Mr Pines’ team had a meeting with Higher Education Department’s chief director of Vocational and Continuing Education, Ms Gerda Magnus for a discussion of the possible solution, and the talks were ‘very encouraging’ according to Mr Pines. Meanwhile, Mr Pines – who turns a golden 77 years old in March, marking his formal retirement – further confirms that final stage of approval of a newly developed curriculum for eight (8) national maritime sector occupational certificate courses is on course. The eight national occupation qualifications for which a new curriculum was developed in record time in 2016 include; Port Operations Master, Marine Electro-Technical Officer, Aids to Navigation Manager, Aids to Navigation Technician, Dock Master, Traffic Controller (Vessel Tracking System), Maritime Search & Rescue Mission Coordinator and Diver (Commercial). According to Mr Pines, the qualifications conceptualized and proposed by SAMSA consistent with the objectives of the Operation Phakisa (Ocean Economy) project, and developed with the full involvement of the maritime industry; will once formally endorsed by the South African Qualifications Authority (SAQA) greatly enhance the position of holders both locally and for the African region, while providing international recognition. In this next video (04:25 minutes: Click Here), Mr Pines provides an update of the curriculum’s formal approval process. 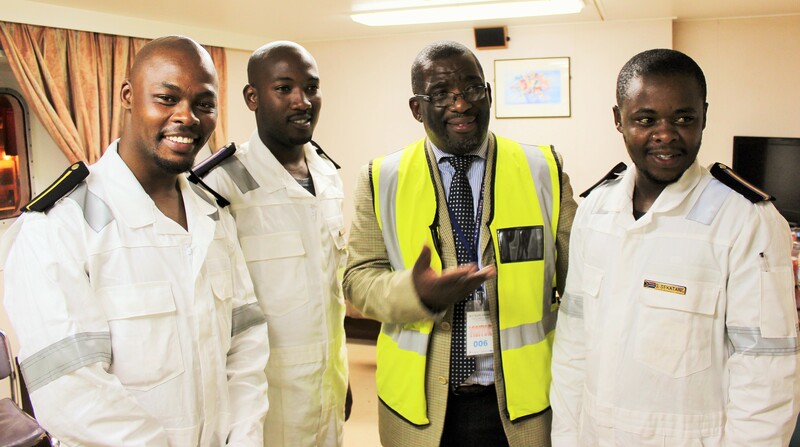 He also chats briefly about his pending “real retirement this time” from next month, and about which he gives an assurance that there will certainly be continuity at SAMSA with the maritime sector education and training curriculum campaign. He hints on his possible successor. Setting sails for a brighter future! It was with appreciation of that reality when early evening on Monday, a delegation of the South African Maritime Safety Authority (SAMSA) joined a Philippines business delegation at the Pretoria home of the Philippines’ Ambassador to South Africa for a casual yet exploratory chat about possible links that could benefit both countries in the field of maritime.